NEW YORK -- Volkswagen Group aims to boost vehicle sales in the United States by at least 12 percent to 500,000 this year, VW of America CEO Jonathan Browning said. "We will outperform the market with double-digit growth," Browning said at a press conference in New York on Sunday. Achieving 500,000 annual sales would be the first time VW has reached that number in 39 years. VW is introducing new models in the United States and last year opened a new factory in Chattanooga, Tennessee, as part of plans to increase group annual U.S. sales to 1 million -- 800,000 VW brand cars and 200,000 Audi models -- by 2018. In 2012, Browning expects a sales boost from models such as the Passat and Beetle, which will have their first full-year of sales, along with a refreshed CC that arrives at dealerships in the spring and a new Jetta hybrid that launches later this year. He said VW will focus on gaining a better brand acceptance and quality perception with U.S. customers in 2012. "It is a steep challenge, but something which is deliverable with right actions," Browning said. In 2011, VW group, including the VW, Audi, Bentley, Lamborghini and Bugatti brands, sold 444,192 vehicles in the United States, up 23.3 percent compared with 2010. All VW group brands had a successful sales year. VW brand sales grew 23.3 percent to 324,402 units; Audi sales increased 15.7 percent to 117,510; Bentley sales were up 31 percent to 1,877; Lamborghini sold 340 units while Bugatti sold 12 of its Veyron models in the United States in 2011. VW Group's U.S. market share grew 0.4 percentage points to 3.5 percent last year. 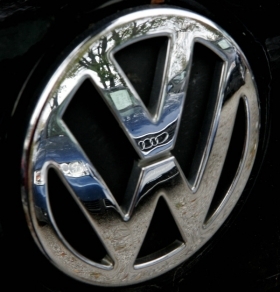 The VW brand's share at 2.5 percent was the highest to date, Browning said. Browning forecasts the U.S. market to grow to between 13.5 and 14 million units in 2012 depending on economic conditions. "In the medium term expect 15 million to 15.5 million units, but certainly not the inflated pre-crisis levels," he said. He said VW of America planned to achieve an operating profit in 2012 for the second consecutive year, excluding its factory operations. Browning said VW has not yet decided on the future of the Chrysler-based Routan minivan. "The existing contract with Chrysler runs through calendar year 2013 with an option for 2014. We have not made a decision on that. We are concentrating on our core models, the Jetta, Passat, Beetle, Golf, Tiguan. The Routan is a useful bonus to our portofolio. We are happy with its role in our portfolio." Browning would not confirm whether VW will introduce an SUV in the United States positioned between the Touareg large SUV and smaller Tiguan. He said: "It is an addition we would like to see. But I cannot give any confirmation of the project or timing. We have to drive our business with our existing models."